November is Canada’s nation­al eczema month. EASE is an organ­iz­a­tion that sup­ports eczema aware­ness in Canada, and tonight they will be hav­ing a dis­cus­sion about what it means to live with eczema. Unfortunately I can­not attend due to clin­ic com­mit­ments, but wanted to share my thoughts on this con­di­tion as it is a con­di­tion close to my heart. Eczema, or atop­ic dermatit­is, is a skin con­di­tion in which the skin is very dry, itchy, and flaky. The bar­ri­er of the skin is com­prom­ised — as research sug­gests — almost from the out­set ( most babies who exper­i­ence eczema or atop­ic dermatit­is do also later in adult­hood ), and there is a con­nec­tion to allergy ( called the aller­gic tri­ad ) in which indi­vidu­als who are afflic­ted with eczema may also have asthma and rhin­it­is ( a runny nose that is triggered by allergy ). You will not die from eczema. It is not a con­di­tion which typ­ic­ally has many research dol­lars put in its dir­ec­tion because people who do not have severe eczema do not com­pre­hend that it really is impact­ful to your phys­ic­al, men­tal, and emo­tion­al well-being, and that liv­ing with end­less suf­fer­ing — as in any con­di­tion — is not really an adequate qual­ity of life. The sleep­less nights with scratch­ing, wak­ing up with bloody sheets, showers that are pain­ful and sore, itch­ing with stress and some­times itch­ing for no reas­on at all, and not know­ing the causes from one day and the next. The peel­ing skin from cortisone, and some­times the need for cortisone shots, anti­histam­ines, immun­osup­press­ives to stop the immune response… these are all eczema real­it­ies. Being told you are doing some­thing to eli­cit this, that you don’t want to stop, that you won’t feel bet­ter and that it some­how is related to self-con­trol. Tell that to indi­vidu­als with eczema. All they want is to stop scratch­ing. Dermatologists do have an excel­lent know­ledge of the skin because of course, as spe­cial­ists, they are trained in that organ. However, some­times when we look exclus­ively at an organ we are more apt to see symp­toms only rather than cause. Eczema is a tough con­di­tion to crack, because where the patho­logy lies is often deep­er than the skin’s sur­face. There abso­lutely are ways to reduce inflam­ma­tion asso­ci­ated with eczema, and there are known trig­gers which can aggre­v­ate an immune response. So why don’t you know about them? Not every­one with eczema is afflic­ted with the same trig­gers — This is unfor­tu­nately true. There are how­ever a series of pat­terns which DO ring true, which I will dis­cuss in a minute. Some of the things which can help eczema over­all take time and patience. Many patients who are itchy and sore just want relief (I should know, I was one of them). Eventually how­ever, you have to ask your­self, do you just want symp­to­mat­ic relief or can you get to the bot­tom of the trig­gers? Triggers like food aller­gies that often go undia­gnosed for those with eczema because the meth­ods of test­ing are unfor­tu­nately not covered, or very rarely dis­cussed with­in our med­ic­al sys­tem. OHIP does not cov­er either IgE blood test­ing for foods or IgG delayed-type hyper­sens­it­iv­ity blood test­ing for foods, and as a res­ult, it is expens­ive for patients to pay out-of-pock­et for every poten­tial trig­ger — and there can be many. IgE skin scratch tests offer mostly false neg­at­ives for those with skin issues — the skin is such a mess to begin with — it does not react when it is sup­posed to, and does when it should not. So what are the triggers for eczema? The break­down in eczema is in the innate immune sys­tem. This is the part of the immune sys­tem that is respons­ible for telling the body what is for­eign and what is not in the skin, lungs, and gastrointest­in­al tract from the moment we emerge from our mother’s womb. If you think about it, it makes sense as, when we are babies, these are the major ways we can suc­cumb to infec­tion. Unfortunately, if one part of this sys­tem is affected by some­thing seen as “for­eign”, then we know the oth­er parts of the sys­tem are strug­gling. In eczema, research demon­strates that the gastrointest­in­al tract is where this break­down occurs, and can often occur before birth. Mothers giv­en good bac­teria or pro­bi­ot­ics, and spe­cif­ic strains of pro­bi­ot­ics that bal­ance a very react­ive innate immune sys­tem, do pre­vent and reduce the incid­ence of eczema in chil­dren of moth­ers with eczema or a genet­ic con­nec­tion to eczema. Bacterial bal­ance in the gastrointest­in­al tract is a very import­ant part of eczema man­age­ment. 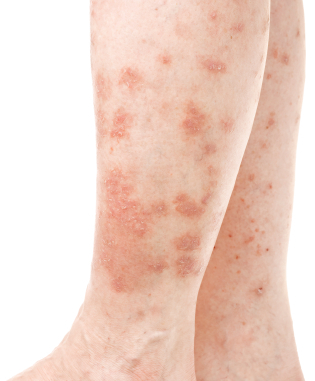 Eczema break­outs do occur reli­ably with cer­tain foods. These food group­ings have allergy poten­tial, and cer­tain types of eczema are more prone to allergy (IgE-asso­ci­ated atop­ic dermatit­is) versus those that are not IgE-asso­ci­ated (IgE is an immun­o­globulin or pro­tein pro­duced by our body in the response to allergy). Dairy pro­teins, wheat and wheat glu­ten, toma­toes, cit­rus and cit­rus juices, nuts, cer­tain fruits (apples from spe­cif­ic trees that have links to oral aller­gies, peaches and cher­ries from the prun­us fam­ily) pota­toes, and refined and syn­thet­ic sug­ars have all been linked to eczema. However, as there is such a range of indi­vidu­als who react dif­fer­ently, evid­ence is mostly incon­clus­ive. That does not how­ever mean we should dis­count all of the research com­pletely! It does mean that it will take more work to determ­ine what is the cause. Food aller­gies are the lead­ing cul­prit in eczema. Hormone sys­tems can also add to the mix, as stress and stress hor­mones have the abil­ity to increase inflam­ma­tion. Stress hor­mones and the hor­mone con­nec­tion can also be an import­ant con­trib­ut­or in eczema. Chronic inflam­ma­tion is an ongo­ing issue in eczema. Corticosteroids do help with loc­al inflam­ma­tion, but they do not sup­port sys­tem­ic inflam­ma­tion. Important things like a good qual­ity omega-3 oil can really sup­port inflam­ma­tion path­ways and act like cortisone and cortisol, but also help to sup­port the pro­duc­tion of a good skin bar­ri­er. The skin bar­ri­er and its inab­il­ity to stay intact and pro­duce adequate oils as a pro­tect­ant is an issue in eczema. My immunosuppressives are doing the job, so why should I care about getting to the root cause? Like any­thing, we have to won­der about too much of a good thing. Immunosuppressives like tac­rolimus as in Protopic and Elidel are won­der­ful to get flare-ups under con­trol, and at many points restore qual­ity of life. The side-effects can be intense, and these inter­ven­tions do have links to car­ci­no­gen­es­is. Yes, can­cer. I am not try­ing to scare or pre­vent people from using these inter­ven­tions when they need them as they do have pos­it­ive safety pro­files, and I myself used them quite a bit when I needed them. However, to pre­vent fur­ther risk from their use it is import­ant to find the root cause. What can you expect your life to look like with eczema when you find out your triggers? You will have improved health, but patience is def­in­itely a vir­tue. You may con­tin­ue to need to rely on cortisone or oth­er immun­osup­press­ives but you may be able to reduce the amount that you depend on them. You may need to handle your stress dif­fer­ently than your friends. You may not be able to eat whatever you want, but let’s face it, who can? You will still need to apply good qual­ity mois­tur­izers (i.e. Pure + Simple, La Roche Posay, Eucerin, Cetaphil, Keri) to help with dry­ness and keep your skin bar­ri­er intact, but per­haps less as your skin bar­ri­er might be a little more resi­li­ent than it nor­mally would be. You can expect to have an improved qual­ity of life, which is ulti­mately what all of us endeav­our to have. Keep strong, my friends! There is a light at the end of the tun­nel. Baker BS. The role of microor­gan­isms in atop­ic dermatit­is. Clin Exp Immunol 2006; 144(1): 1 – 9. Benedetto A et al. Atopic dermatit­is: A dis­ease caused by innate immune defects. J Invest Derm 2009; 129: 14 – 30. Earls, A. Atopic dermatit­is and its asso­ci­ation with innate immunity. Integrative Health Practitioners 2010. Hultsch T, Kapp A, and Speigel J. Immunomodulation and Safety of Topical Calcineurin Inhibitors for the Treatment of Atopic Dermatitis. Dermatology 2005; 211: 174 – 187. Kremmyda LS et al. Atopy Risk in Infants and Children in Relation to Early Exposure to Fish, Oily Fish, or Long-chain Omega-3 fatty acids: A sys­tem­at­ic review. Clinic Rev Allerg Immunol 2009. Saaf AM et al. Global Expression Profiling in Atopic Eczema Reveals Reciprocal Expression of Inflammatory and Lipid Genes. PLoS ONE 2008 3(12): e4017.